Three 30-something guys are surfing The Long Tail and demolishing the boundaries of traditional television broadcasting along the way. Adam Quirk, Erik Nelson, and Aaron Valdez are the sole employees of Wreck & Salvage LLC. In addition to making customized videos for clients, they create a monthly, hour-long online video show called Tricorn. But you won’t find them out on the town, shooting original videos of breaking news stories. They do that occasionally, but they are primarily “remixers” who take snips of existing videos and splice them together to create a mashup. And they broadcast many of these mashups on their show, streamed live on Livestream. And they have approximately 100,000 viewers every month. They also use instant messaging to chat with each other during the broadcast, because Adam lives in Brooklyn, Erik lives in Vermont, and Aaron lives in Michigan. When you watch CNN news on your TV, do the producers interact with you while you sit in your living room? Do they use a chat box to take requests and answer questions? Do they accept amateur videos from “citizen journalists”? They do on their Ustream channel. They’re not actually live-streaming 24/7 yet, but stay tuned. Garfield interviewed Quirk and many other “early adopters” of online video for his book, which is literally a user’s manual on creating, uploading, distributing and live broadcasting online videos. This is not the kind of book you read on vacation. This is the “bible” of online video production and distribution, written by one of the first guys to put videos on his blog. That was way back in January 2004 B.Y. (Before YouTube). But it didn’t take long for Garfield and other video enthusiasts to change the game completely. Haven’t we always heard that a picture is worth a thousand words? Isn’t a video a lot more engaging than a text-only blog post? And it was just a matter of time before people stopped putting videos on their blogs, and began vlogging. The video IS the blog post! When Garfield attended a September 2008 Barack Obama rally in Boston, he took along his Nokia N95. By livecasting the rally using Qik.com and wi-fi, he was able to use the cell phone to shoot the video and simultaneously receive text messages from viewers who were watching the rally on his website. Did you get that? This is viewers interacting live with a video producer on his website while he’s streaming a developing news story. Lest you think only “citizen journalists” are doing this, traditional mass media broadcasters are also jumping on the online video bandwagon. You’ve already seen CNN’s Ustream channel. Here’s CBS’s offering. Garfield writes about the time he was having trouble recording a cable show on TiVo. He called Comcast, but somehow he couldn’t explain the situation adequately over the phone. So he offered to use his cell phone and Qik to stream his TV screen to Comcast while he talked to customer service on his landline phone! Imagine being able to stream a video of a consumer product problem to the company’s customer service department. No need to pay a repair person to come to your home and diagnose the problem. And what about all those birthday parties, the cute things your kids do when you least expect it, and the time you ran into a local county official in the grocery store? All of those moments that you want to remember forever. Wouldn’t it be great to be able to record a quick video of the event? You can start very simply. Does your cell phone record video? Just buy a good mic and maybe an inexpensive light source. Use a separate mic, not the built-in mic. Several people Garfield interviewed for his book recommend spending more money on a good light source and a good mic than you spend on the camera. What are my sound and lighting options? If I have a webcam, what software can I use to record and shoot? What kinds of video editing programs are available? How do I upload a video to YouTube and other video sharing sites? How do I broadcast live? If you have asked any of those questions, Garfield has the answers. Including step-by-step instructions and plenty of screen shots. He also interviews at least 40 of “the best video producers,” including Thomas Gensemer, managing partner of the company that managed Barack Obama’s online video campaign during the 2008 presidential election. The interviews are scattered throughout the book and are also available on Garfield’s website. As video interviews, of course! So are you ready to push the boundaries of television broadcasting? Or do you just want to start recording important events in your life? If so, here’s good news. You don’t have to pay hundreds of dollars to take a video production class at your local college. Or thousands of dollars on video equipment. 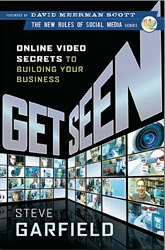 Just pick up a copy of Get Seen and a $150 Flip Ultra camera. Social Media Examiner gives this book a 5-star rating.